You'll find us on the border of Menlo Park and Redwood City, California. We're about halfway between San Francisco and San Jose airports, just off of route 101. From 101, take the Marsh Road exit towards Atherton. Turn right at Starbucks, and look for us in the Marsh Manor Shopping Center. Our center is above Delucchi's supermarket, and our entrance door is near the rear parking lot. Look for the orange giraffes and you'll see our entrance. 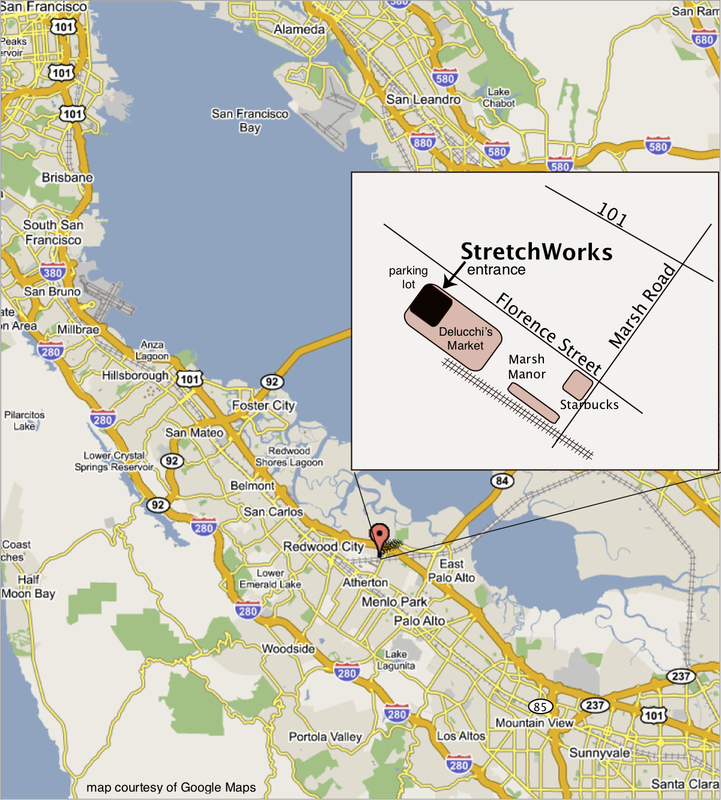 StretchWorks is in the heart of Silicon Valley, within minutes of Palo Alto, Mountain View and Santa Clara. If you will be traveling to the area for business or pleasure, please contact us ahead of time to schedule a Private Session with one of our instructors. Our studio is within a mile of San Francisco Bay. We are the Bay Area center for Bob Cooley's RFST (Resistance Flexibility and Strength Training). Drop in any time to try one of our classes, or call us to schedule a Private Session.